UFC 230 is certainly a stacked fight card, but I’m struggling to find value on the betting lines. There are a lot of juiced favorites, yet not many of the underdogs are appealing. Perhaps like last week, this will be a card where the best lines emerge in-play. Nevertheless, here are my breakdowns of the fights that I’m interested in betting. In his last outing, Adam Wieczorek caused a huge upset by catching highly touted Canadian wrestler, Arjan Bhullar, in an omoplata after being dominated for most of the fight. Wieczorek has a lot of grit and is fine with catching a flight from Poland to New York fill in as a short notice replacement. In addition to heart and determination, Wieczorek’s best asset is his top game. He threatens with submissions and is deadly with ground strikes. However, he doesn’t seem like much of a wrestler and could struggle to take his opponent down. On the feet, Wieczorek is mediocre at best. I hate to call a professional fighter unathletic (especially as I sit here in a pitch black dungeon surrounded by empty bottles of Bulmers cider), but Wieczorek honestly moves like he’s underwater. He doesn’t react well to pressure and never checks leg kicks. Standing in front of him will be Marcos Rogerio, a supremely aggressive kickboxer that throws venom in all his strikes. Rogerio fires thudding kicks to the legs and body, and I expect him to go low in order to negate the 5-inch reach disadvantage while moving forward. As you’d expect from a big dude that throws with bad intentions, Rogerio is a front runner and will likely be at a cardio disadvantage if this goes past one round. He also has the ability to implode spectacularly in the face of adversity. Despite getting the better of Ovince St. Preux on the feet in round one, he threw a lazy kick in the next round which was caught. He was then taken down and submitted. Against Nikita Krylov, Rogerio inexplicably tried to guillotine his opponent instead of defending takedowns. He was once again submitted. Even though he makes some bad decisions, this is a very winnable fight for the Brazilian – especially since his opponent is in on short notice. I have some action on Rogerio at +250 as he has an obvious path to victory with his striking and pressure. Fighting out of the acclaimed Tiger Schulmann’s Mixed Martial Arts, Julio Arce has looked phenomenal in his two UFC fights – defeating solid opponents in Dan Ige and Daniel Teymur. I believe Arce has all the tools to compete against top competition in the featherweight division and it’s only a matter of time before he ascends the rankings. A well-rounded southpaw, Arce’s most notable assets are his smooth boxing, excellent footwork and lateral movement. Arce’s unpredictability on the feet caused huge problems for Daniel Teymur, who is a very legitimate striker himself. After dominating the fight with his boxing, Arce was able to sink in a choke in the third round, demonstrating he has a solid ground game too. Arce’s opponent, Sheymon Moraes, is a hard hitting Brazilian striker – but this feels like a favorable stylistic match-up. Moraes had a rough debut in the UFC against Dagestani super-prospect, Zabit Magomedsharipov. While the Brazilian found success standing, the grappling onslaught of his opponent was too much. In his second appearance, Moraes had a much more competitive fight with Matt Sayles, where he landed the cleaner strikes to secure a decision victory. Unlike Arce, Moraes is more flat footed, sits down on his shots and isn’t much of a volume striker. While he packs a serious punch, all that power comes at a cost and he faded late against Sayles. Sheymon Moraes is no bum, but styles make fights. I think Arce will be in and out like a phantom in the night, landing punches while angling off to avoid return fire. As the fight goes on, I wouldn’t be surprised to see Arce mix some grappling in and perhaps score another late submission. The price feels a bit steep, but I do think the Tiger Schulmann’s prospect gets the job done. I’m not completely averse to using Julio Arce as a parlay leg at -350. With some reshuffling of the fight card, Jared Cannonier jumps in on short notice to take on savvy veteran, David Branch. In his last fight, Branch annihilated the explosive Brazilian kickboxer, Thiago Santos. The consensus opinion was that if Branch were to win, he would use his excellent ground game to do so. Unexpectedly, Branch starched Santos on the feet and he may not be far away from a middleweight title shot. While the Brooklyn native has solid boxing, his jiu-jitsu is his best weapon. This is probably why he’s such a big favorite – Cannonier has shown questionable takedown defense and doesn’t offer much off his back. Here’s the thing though, Cannonier may have been outgrappled by Glover Teixeira, but he was working full-time in Alaska at that point in his career. Since then, he moved to Arizona to join the world famous MMA Lab and has evidently been working on his counter-wrestling. Although he was taken down by Jan Blachowicz multiple times, Cannonier was able to work his way back to his feet repeatedly. On the feet, Cannonier is a slick striker with fast hands and big power. He picks his shots carefully, moves well and doesn’t get tired. Hopefully his cardio holds up for this short notice call-up. Having always fought larger opponents, this will be the first time Cannonier fights at middleweight – which looks like the most natural class for his 5’11 frame. Branch winning via grappling seems like the most likely scenario, but his -470 moneyline would indicate a near certainty. I don’t think that’s the case whatsoever. Can Cannonier stuff takedowns and win the striking exchanges? At +375 I’m willing to find out. In a thrilling middleweight encounter that probably should have happened years ago, top contenders Ronaldo “Jacare” Souza and Chris Weidman collide. If you were to make a shortlist of the best jiu-jitsu practitioners to ever compete in MMA, Souza would be near the top. The nickname “Jacare” means “alligator” in Portuguese, and gives an indicator of the fighting style displayed by this Brazilian warrior. The way Souza irons out his opponents on the mat is legendary, and it’s usually only a matter of time before the fight ends in submission once it hits the ground. Now 38-years-of-age, Souza may be past his prime but is still able to compete at the highest level. Despite losing his last bout to the surging Kelvin Gastelum, Souza held his own on the feet and could easily have gotten the decision. Souza may struggle to take down All-American wrestler, Chris Weidman, so he’ll need his striking to be sharp in this one. Weidman has been out for a while with an injury, but seems motivated to compete and potentially reclaim his middleweight title. After struggling through adversity at the end of round one in his last fight, Weidman staged a comeback, taking down the aforementioned Kelvin Gastelum and choking him out. Typically, Weidman likes to mix up his strikes and wrestling to keep opponents guessing – but I’m not sure that would be a wise move against an elite black belt like Souza who could potentially sweep him. As the superior wrestler, Weidman will be able to dictate where the fight takes place, and I can’t imagine he wants it on the ground. This makes me think we’re likely to see a kickboxing match. I believe Weidman has the better fundamentals and more energy efficient strikes, but Souza is dangerous on the feet as well – knocking out the defensively porous Derek Brunson a few fights ago. While I favor Weidman, I’m not sure I want to play him at -185. I may reconsider if money comes in on Souza. I think both fighters are durable, so I don’t mind betting that the fight goes to decision at -130. 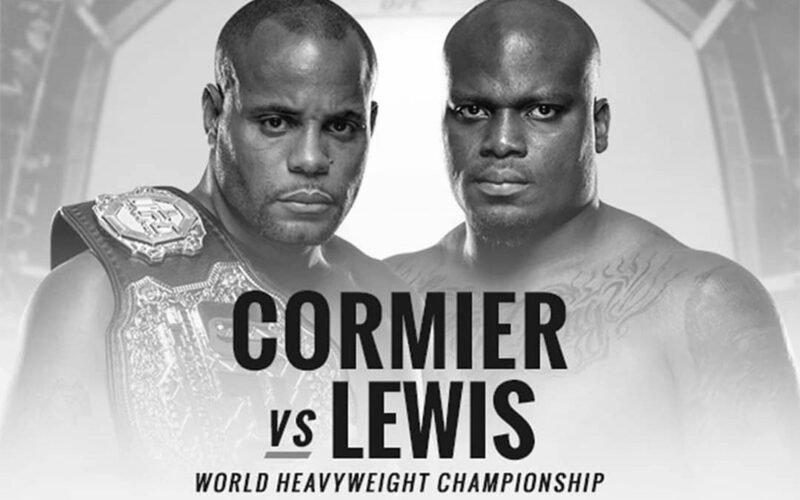 Daniel Cormier, an Olympic wrestler with great cardio, fantastic top control and underrated boxing takes on Derrick Lewis, a large man that hits extremely hard. This is a silly fight, especially considering Lewis took a brutal beating a few weeks ago and only scored a Hail Mary KO thanks to a momentary lapse in concentration by his opponent, Alexander Volkov. Lewis has given up takedowns to much lesser wrestlers than Cormier, yet simply powers his way back to his feet when he’s had enough of being on the mat. I don’t think that’s going to work in this case. Knowing Lewis can always end the fight with a big swing, I expect Cormier to shoot early. The Olympian works well from half guard and side control, as well as in the crucifix position as we saw against Volkan Oezdemir in his most recent light heavyweight title defense. The most likely scenario for this fight is Cormier destroying Lewis from top position, and the odds indicate this. Personally, I’m passing on this fight as I have no interest in playing Cormier at -700. That being said, if you want to take a stab on Lewis at +500 in a fight where he has every single disadvantage except for knockout power – I can’t blame you! 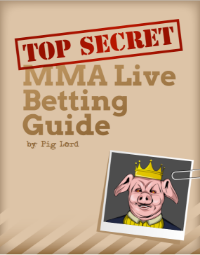 Last week we got some good live bet lines (such as Anthony Smith at +220 after round one) and I’m hoping this week will be the same. I recommend BetDSI for live betting in the States and Ohmbet if you’re from Europe or Canada.